This is the third part of a series of analyses relating to Russia transport, shipping and the Belt and Road Initiative (BRI). The existing and future strategic role of shipbuilding in Russia is not to be under-estimated despite the prevailing dominance of Asian shipyards. Currently, Russia faces a series of obstacles in relation to the overall development of Russian-flagged shipping, port infrastructure, multimodal logistics and the continued development of the Northern Sea Route (NSR) on the global maritime scene. The main core of Russian shipbuilding is mainly clustered around St Petersburg, Murmansk and the Far East. 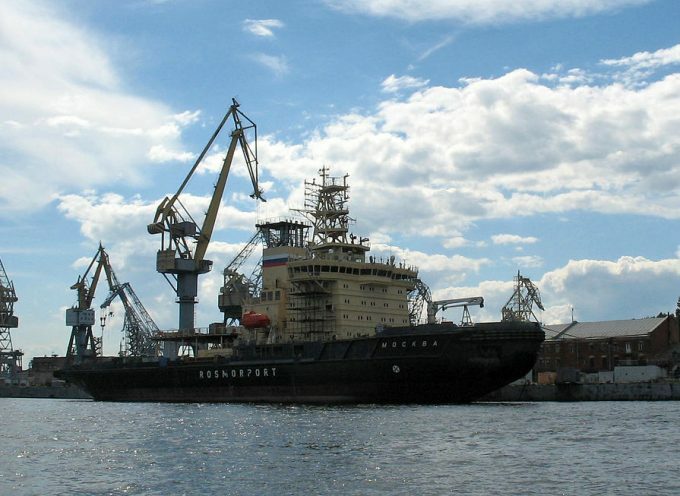 There are other smaller shipyards in Rybinsk, Nizhny Novgorod, Zelenodolsk and in Crimea. United Shipbuilding Corporation (USC) along with Zvezda are the leading major shipbuilders. Russian shipyards have a well-known reputation for having a bad ‘score sheet’ regarding sustained ability and effective building capability especially within the naval shipbuilding sector. Much has been discussed about these aspects within the industry and by experts in recent years. However, the focus of attention in this article is mostly on the civil shipbuilding sector, which is in a poor shape compared to other global shipyards. The Soviet monolithic naval industries were highly dependent on the “military-industrial complex” demands, all of which vanished practically overnight in the 1990. The hard-hitting demise of the Soviet Union fossilised some shipyards and closed down others. Equipment, skills and know-how were not replaced, apart from a couple of niche sectors which struggled on, (nuclear icebreakers and submarines). Consequently, the entire industry greatly suffered not only during the Yelstin period but also this also continued during the Putin and Medvedev presidencies right up to 2012. New advances in technological and work processes simply did not get carried over into the Russian ship industry in a timely or sufficient manner. A glimpse of this was the need for a partnership between STX France and USC over the building of the Mistral-class ships. Shipbuilding certainly was not seen as a needy strategic priority, unlike other countries especially in Asia. High-level government policies left out the resurgence of an effective national shipbuilding infrastructure for well over a decade. This meant that Russian shipyards were not capable of trying to keep the inertia going in any way without significant and steady state support, with the USC cluster taking a hefty proportion of state support. Back in 2014, president Putin asserted that Russian shipbuilding should be on a par with foreign producers. Shipbuilding is a complex affair, mostly based on customer needs, but also including other parameters, such as national political drivers and forecasted economic trends. The West imposed a series of sanctions that had far-reaching repercussions on naval shipbuilding from marine engines, paint coatings and navigational equipment. These also clearly showed up the barriers and threats to Russia. The sanctions sent a signal to the heart of government, paving the way for a fundamental re-evaluation of policies across the board. They acted as a catalyst in gradually reshaping Russian economic policies, including those related to the BRI. Further Western sanctions on the Russian shipbuilding sector are planned. Russian ship-building is currently at a stage of not only requiring substantial modernisation programmes but also acceleration of these activities, to stay afloat so to speak. The bottom line is self-sufficiency. With this in mind, the Russian“military-industrial complex” (known in Russian as the oboronnyi-promyshlennyi kompleks, or OPK), still gets a lion’s share of the budget. Therefore, it is of interest to see how this ultimately translates into the civilian sector. The share of civilian production in the shipbuilding sector accounts for 13.5%, with the OPK stating an increase to 30% by 2025. This predominance is not surprising given the increasing asymmetric hostile geopolitical environment that Russia is faced with. ” Minister of Industry and Trade Mr. Denis Manturov. The article “Foresight in civil shipbuilding 2030” outlines the complexities and issues faced by the Russian shipbuilding industry and describes various scenarios in detail. One aspect noted is that “innovative scenarios assume a shift from mass production order to small-scale or even single-unit niche production”. It can be argued that this has happened to many shipyards both in the civil and military oriented sectors. One niche area exploited by the National 2013-2030 programme is the development of offshore support vessels, (OSV) namely small specialised high-tech ships that work in the Arctic or harsh marine environments. Recently Gazprom ordered 4 offshore vessels from Zvezda. Another up-and-coming sector is the building of domestic fishing ships. The article also provides some figures related to “the ratio of the combined tonnage of the ships produced in one year (in CGT) to the number of employees working at the shipyard is taken into account.” This is part of an assessment of the workforce productivity. Whereas Japan is approximately 180 CGT per person, South Korea not far behind with 145 CGT, but it is only 20 CGT per person in Russia, (Minpromtorg, 2013). The National Programme is also a driver for associated technological spin-offs, to support the development of civil projects. One such example is marine propulsion. However, the industry is still beset with problems of modern facilities, financial and managerial woes. The ministry of industry has also a list of requirements for state support for prospective ship operators wanting to build in Russia. This also applies to incorporating domestically produced components such as engines and control systems. Import substitution is also a headache for segments of the civil shipbuilding sector as well as other sectors such as domestic civil aviation programmes. At present, there is reliance on Chinese-made components as a stop-gap measure, however this has resulted in problems with the quality and durability. There are pitfalls to this kind of carrot and stick approach, as it also gives preferential status to one of two shipyards, as exceptions to the application of the rules will likely go the major players and not to the smaller yards or customers. However, there is a long-term silver lining to these dark clouds, which may have a positive knock-on effect on naval shipbuilding in areas of dual-use technology programmes, but at a greater cost and time delays for the foreseeable future. Nonetheless, a systematic revitalisation of Russian shipbuilding is painstakingly taking shape, with a number of positive stories to report. The Sredne-Nevsky shipbuilding yard is one such success story, responsible for the serial production of minehunters for the navy, it has become a digital shipyard, arising from a modernisation process starting in 2013. Another example is the 30 billion roubles ($459 million) 17-year planned investment in the development of the Krasnaya Kuznitsa shipyard in Arkhangelsk region. This shipyard is part of the Zvezdochka ship repair facility, itself part of USC. A gradual emphasis is being placed on changes to reflect the need for optimization of technological processes around construction production systems, using advanced machinery such as plasma gas cutting machines. Other crucial aspects logistics, inventory-keeping, document control and more coordinated relationships with suppliers. Another technology being rolled out is VR prototyping (3-D rooms) systems to help designers improve the quality of documentation. Amur-based ASZ shipyard has been modernising its equipment and machinery. Just one example of several shipyards currently getting a long-awaited overhaul of systems and processes. The overall goal is to develop a maximum production process per square metre of a given plant. Russia doesn’t need to look far to see how this is achieved in Chinese shipyards. For example, any aerial photo of Dalian shipyard (DISC) will reflect the intensity and complexity of various commercial and naval ship constructions. At the same time as the development of BRI moving progressively westwards, the Russian pivot towards the east is gaining more leverage, on all levels. From schemes to provide land for citizens, to offshore entities based on Rossiky Island are being implemented. One aspect of interest to me is shipping and the industries connected to this sector. The Russian shipbuilding flagship project is the construction and operation of Zvezda Shipbuilding Complex in Russia’s Far Eastern Primorsky Region. Part of the “Shipbuilding Industry Development, 2013-2030” included geographical clusters, with the northern cluster having an historic advantage. A priority in the far-eastern cluster is the notable development of the construction of a mega shipyard in the Far East, as part of a dedicated shipping cluster, “Zvezda complex”. A project in the making since 2012, the first part of the shipyard’s production facilities was commissioned in 2017 and work started in 2018 on cutting steel for the first ever 114,000t dwt Aframax tanker order. The yard also picked up an order for LNG-fuelled tankers for Sovcomflot in December 2018. Over $3 billion is already earmarked for the construction of the mega shipyard at Bolshoy Kamen, it will be highly influential project for the region as a whole with an expected 7000 employees working there, once it is finally completed in 2024. The Zvezda mega-yard will comprise of a vast production facilities and workshops and will be used to build marine equipment such as Azipods propulsion units and also ships, including LNG carriers, tankers and potentially nuclear icebreakers. It will certainly will be a boost as a means of cushioning the increasing impacts of Western sanctions on Russia, by having such a big domestic shipyard. Better late than never, given the extensive existing Chinese and South Korean shipyards in operations for decades. 115 ocean vessels have are planned to be constructed at the Zvezda shipyard. This figure is a tad optimistic I believe, as it is not known how many will actually be built and launched. This depends on the amount of government subsidies obtained by customers. This shipyard is likely to involved in the building of the project 10510 ‘Leader’ class of nuclear icebreakers. This will be done in cooperation with other shipyards for subassemblies and subsystems. Zvezda had already signed deals with major Russian companies to build large vessels, including LNG gas carriers and shuttle tankers for the Arctic LNG-2 project as a joint venture with South Korean shipbuilders, Samsung Heavy Industries Co. Ltd relating to the transfer of technical know-how competencies in this specialist area, significantly financially supported by the Russian government. South Korea is certainly an important player in development of the NSR and in working collaboratively on the construction of specialised tonnage. South Korean yards have built and continue to build a number of specialised ice-classed icebreaking tankers as part of the Yamal LNG project. The Arctic sector could be potentially a key driver for the Russian shipbuilding sector, although this will depend on the steady input of quality R&D and investment into the high-technological aspects that underpin this sector. This has not yet materialised in a sustained way, apart from limited production of ice-class support vessels for the oil and gas sector. More on this in a later analysis dedicated to Arctic shipping. A nagging headache for Russian shipyards is the risk of shipboard fires. There has been a spate of fires in Russian shipyards including a high-profile incident during the under-construction of the icebreaker ‘Viktor Chernomyrdin’ last November. Likewise, this is another example of a major shipbuilding project that has been hamstrung by delays in schedules and an over-running budget. As a result of these incidents work is underway to improve and implement nationwide fire standards, in particular bringing in automated fire control and monitoring systems control and mobile fire-fighting systems. However, extensive efforts to improve the overall safety environment is still significantly neglected, as the loss of the huge dry-dock PD-50 in October 2018 with tragic consequences shows. Russia like many other OECD countries is faced with an increasing aging and shrinking population. This presents a dilemma in recruiting and maintaining a skilled workforce. Another tough nut to crack is the issue of a chronic shortage in specialised manpower within the shipbuilding sector, something is also common to other parts of the world. Therefore, it is of interest then to see the creation of military scientific units so as to enable conscripts with the talent and skills to serve for one year on bespoke naval technology and ship building projects. The first technical scientific company was set up in Sevmash in the summer of last year. Currently, Russian shipbuilding is still experiencing a period of a slow transition from inherited Soviet-era processes and management. It is considerably lagging behind both West and East shipyards regarding major ship construction projects. Sporadic efforts have been made to modernise and upgrade a number of yards and production processes, although there is still much more to do in a coherent and transparent manner. The main focus is on process upgrades and machinery renewal as part of a package of digital transformation in production, automated work and design practices. A number of government initiatives have been implemented to re-energise the civil shipbuilding sector, largely left moribund for several decades. The consequences of increased production costs and time delays within the civil shipbuilding are nevertheless hindering renewal and potential growth for the industry. This has led to a steady decline in the number of ships built in Russia in the last decade. The sector faces a number of obstacles, namely increasing impact of sanctions on foreign-produced components. As such, it is a long arduous process of establishing positive image, neutralising the financial burden of technological advances, carrying out digitalisation, and maintaining a highly-specialised workforce.